????? A title from our extremely successful series -- all EIGHT (!) 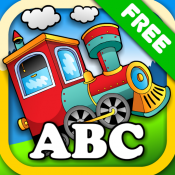 RANKED #1 APP FOR KIDS on APP Store in many countries: ABBY BASIC SKILLS PRESCHOOL, ABBY � PAINTER STAR, ANIMAL PRESCHOOL SHAPE PUZZLES - FIRST WORD; ABBY'S MAGIC LAPTOP FOR PRESCHOOL AND TODDLERS, ABBY MONKEY � ANIMAL GAMES FOR KIDS HD, ANIMAL TRAIN - FIRST WORD HD, ANIMAL PRESCHOOL WORD PUZZLES HD, and ABBY MONKEY � First Words for Preschool: Animals HD). All five other products ranked in TOP 10 in EDUCATIONAL category. This new one is definitely even better! Let your kids explore an amazing world of animals while improving their reading skills. Children will love the adorable illustrations and realistic sounds! The desired area can be chosen by tapping on the corresponding label in the main menu. Your goal is to put the correct animals into the train. The first level is quite easy. The train stops and you have plenty of time to find the right animal. But it becomes much more difficult at higher levels. You must place more animals and the train is faster (does not stop). There is a possibility to modify the game in the Settings. If you choose Tasks Read Aloud, you will hear the names of the animals.